Although it’s easy to head to the electronics store to buy network cables, making do with cables of predetermined lengths can be a problem. More often than not, premade cables are either too short (and require coupling) or too long (in which case, you have to tie up excess cabling and tuck it away somewhere). The end result is usually a mess of extra network cable, wrapped and bundled up alongside your devices and network switches. It works, but it isn't ideal, and it looks horrible. You don't have to deal with premade network cables of incorrect lengths, however. Creating your own custom-length network cables is quite easy once you have the know-how and the right tools. Making network cables takes just a little cutting and crimping, plus a bit of wire arranging. Here's how to do it. Network-wiring toolkits, which include connectors, a crimper, and a tester (among other odds and ends) are available for about $35. To make your own network cables, you need some raw CAT 5, 5e, or 6 cable (a composite cable consisting of four twisted pairs of internal wires), some RJ45 connectors, and a proper crimping/wire-cutting tool. Ideally, you also want a network-cable tester, to easily confirm that your custom cables are correctly wired and working properly. A cable tester isn’t a necessity, but it will save time and prevent headaches down the line should you have a problem with a cable or connection. All of that stuff may sound expensive, but you can find a full network-wiring toolkit--containing the necessary tools, ends for network and phone cables, a cable tester, and some other assorted parts--for only about $30 to $35. Pay a few more bucks, and the kit should include punch-down tools and other probes as well. The cost of a network-wiring toolkit may be prohibitive to people who want to make only a few cables. But if you have the need to make many cables, the toolkit will easily pay for itself over time, as bulk cable and RJ45 connectors are significantly cheaper than premade cables. On top of that, you’ll end up with much cleaner wiring, a nice bonus. You'll find a couple of standard wiring schemes and types of network cables. The Telecommunications Industry Association's T568A and T568B standard wiring schemes define the order of the individual wires and pin-outs for eight-pin modular connectors and jacks, such as those used for network cables. Depending on how you wire the cables, you can make “straight-through” or “crossover” cables; I'll give you more details on what those are in just a moment. First, take a look at the following diagrams to figure out how to arrange the wires to make your cable. For most home-networking circumstances, you’ll want to use the T568B wiring scheme and straight-through cables. The network cables currently connecting your broadband modem, router, and PC or media player to your network switch are all straight-through cables. The T568A wiring scheme may be present in some preexisting residential network wiring or other similar projects, but the vast majority of premade network cables available at retail (at least in our experience) use T568B. Crossover cables are a different matter. Crossover cables serve only to connect similar devices together, in lieu of a network switch or hub. For example, you can connect two PCs directly to each other to transfer data between them using a crossover cable. 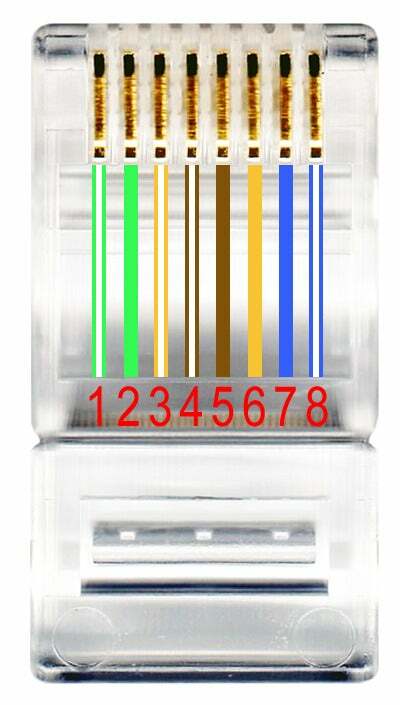 Years ago, connecting one network switch to another also required a crossover cable, but most modern switches, hubs, routers, and similar devices are now equipped with Auto-MDIX ports that can detect whether a crossover is required and automatically choose the MDI or MDIX configuration necessary to properly connect to whatever device is at the other end of the cable. I have included the diagrams above to illustrate the different wiring schemes. Inside standard CAT 5, 5e, and 6 cable, you'll find four twisted pairs of wire of varying colors: orange with orange/white, green with green/white, blue with blue/white, and brown with brown/white. You may also see some fibers in the cable that add tensile strength, and that you can cut off when you're crimping on a connector--the fibers don’t carry any electrical signals. To make a common, straight-through cable, you need to arrange the internal wires and place them into connectors with the same T568B (or T568A) scheme at both ends of the cable. To make a basic crossover cable, use T568A at one end and T568B at the other. Or, to make a 1-gigibit-suitable crossover cable, you must cross all four of the pairs.